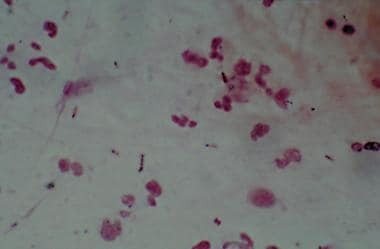 Gram stain showing Streptococcus pneumoniae. Gram stain showing Haemophilus influenzae. Increased tactile fremitus, bronchial breath sounds, and egophony may be present if consolidation has occurred. Decreased tactile fremitus and dullness on chest percussion may result from parapneumonic effusion or empyema. While historical clues and physical examination findings may suggest a causative pathogen, the clinical signs and symptoms of CAP are not sufficiently specific to reliably differentiate the exact etiologic agent. Therefore, additional testing remains necessary to identify the pathogen and to optimize therapy in CAP. Obtain chest radiographs in all patients with suspected CAP to evaluate for an infiltrate compatible with the presentation of CAP and to help exclude conditions that may mimic CAP (ie, lung cancer, pulmonary emboli). [5, 6] Patients who present very early with CAP may have negative findings on chest radiography. In these patients, repeat chest radiography within 24 hours may be beneficial. CT scanning may also be necessary in immunocompromised patients who present with symptoms that suggest CAP in whom chest radiography findings are negative. Serial chest radiography can be used to observe the progression of CAP; however, radiographic improvement may lag behind clinical improvement. Multiple scoring systems are available to assess the severity of CAP and to assist in deciding whether a patient should be hospitalized or admitted to the intensive care unit (ICU). The CURB-65 (confusion, uremia, respiratory rate, low blood pressure, age >65 years) and the Pneumonia Severity Index (PSI) are currently recommended by the 2007 Infectious Diseases Society of America/American Thoracic Society Consensus Guidelines. Patients with CURB-65 scores of 2 or more or PSI class IV-V may necessitate hospitalization or more intensive in-home services. ICU is recommended for any patient who requires mechanical ventilation or vasopressors. ICU admission should also be considered in patients with 3 or more minor risk factors, including respiratory rate of 30 or more, PaO2/FiO2< 250, multilobar infiltrates, confusion, uremia, leukopenia, thrombocytopenia, hypothermia, and hypotension requiring aggressive fluid resuscitation. In regions with high rates of macrolide-resistant S pneumoniae, consider a nonmacrolide alternative. If methicillin-resistant S aureus (MRSA) is suspected, vancomycin, linezolid, or ceftaroline should be added. Mild to moderately ill patients with CAP may be treated entirely via the oral route, on either an inpatient or outpatient basis. The duration of therapy for uncomplicated CAP is usually 5-7 days. [7, 10] Patients should be afebrile for 48-72 hours and have no signs of instability before antibiotic therapy is stopped. The duration of therapy may need to be increased if the initial empiric therapy has no activity against the specific pathogen. Immunocompromised hosts who present with CAP are treated in the same manner as otherwise healthy hosts but may require a longer duration of therapy. Investigations into pathogens associated with compromised hosts may need to be pursued. Community-acquired pneumonia (CAP) is one of the most common infectious diseases addressed by clinicians and is an important cause of mortality and morbidity worldwide. Numerous pathogens can cause CAP. Typical bacterial pathogens that cause CAP include S pneumoniae, H influenzae, and M catarrhalis. Numerous other organisms can cause CAP in the appropriate clinical setting. Furthermore, the so-called “atypical CAP” pathogens are actually common causes of CAP and were originally classified as atypical because they are not readily detectable on Gram stain or cultivatable on standard bacteriologic media. CAP is usually acquired via inhalation or aspiration of a pathogenic organism. Aspiration pneumonia is commonly caused by various pathogens (eg, aerobic/anaerobic oral organisms). Patients with severe CAP should have the benefit of an infectious disease specialist to assist in the underlying cause of their condition. Complications in CAP depend on the infecting pathogen and the patient’s baseline health. For example, various organisms can cause empyema, including S pneumoniae, K pneumoniae (classically occurring in patients with chronic alcoholism), group A Streptococcus, and S aureus. Cavitation is not a typical feature of pneumococcal pneumonia but is relatively common in K pneumoniae infections. On occasion, myocardial infarction can be precipitated by community-acquired pneumonia (CAP). Patients with CAP who have impaired splenic function may develop overwhelming pneumococcal sepsis, potentially leading to death within 12-24 hours, regardless of the antimicrobial regimen used. Morbidity and mortality associated with CAP are most common in elderly patients and immunocompromised hosts. The definitive microbiologic etiology is determined in only 38%-63% of patients who develop community-acquired pneumonia (CAP), depending on the patient population and diagnostic testing used. [1, 21] Organisms have been traditionally classified as “typical” or “atypical” CAP pathogens depending on their ability to be detected on Gram stain or standard bacterial cultures. Typical bacterial pathogens that cause CAP include S pneumoniae, H influenza, and M catarrhalis (Gram stains shown below). The frequency with which CAP is attributable to one of these pathogens varies according to epidemiologic factors (eg, seasonality, patient demographics, exposure history) and the diagnostic testing used. In the past, these organisms had been reported to account for most CAP cases. However, with improvement in diagnostic techniques allowing for better identification of viruses and fastidious bacteria, our understanding of the etiologic agents involved in the development of CAP has evolved. As a result, a smaller percentage of CAP cases are now being attributed to these typical bacterial pathogens. S aureus has not traditionally been considered a typical cause of CAP in otherwise healthy hosts. However, S aureus is well known to cause potentially severe CAP after influenza infection. In addition, community-acquired methicillin-resistant S aureus (MRSA) has increasingly been associated with multilobar necrotizing CAP, including in previously healthy individuals. Importantly, K pneumoniae and Pseudomonas aeruginosa are not typical causes of CAP in otherwise healthy hosts. K pneumoniae CAP occurs primarily in individuals with chronic alcoholism or diabetes mellitus. P aeruginosa is a cause of CAP in patients with bronchiectasis or cystic fibrosis. Other gram-negative pathogens (eg, Enterobacter species, Serratia species, Stenotrophomonas maltophilia, Burkholderia cepacia) rarely cause CAP in patients without underlying lung disease or immunosuppression. Atypical bacterial pneumonias can be differentiated into those caused by zoonotic or nonzoonotic atypical pathogens. Zoonotic atypical CAP pathogens include Chlamydophila (Chlamydia) psittaci (psittacosis), F tularensis (tularemia), and C burnetii (Q fever). Respiratory viruses are another important cause of atypical CAP. While certain viruses may be zoonotically transmitted (eg, Hantavirus and avian influenza), most are transmitted person-to-person. In a more recent population-based surveillance study of CAP among adults presenting at one of 5 hospitals in Chicago and Nashville, the annual incidence of CAP was estimated to be 24.8 cases (95% CI; 23.5-26.1) per 10,000 adults. The median age of patients presenting with CAP was 57 years (interquartile range, 46-71 years). Similar to the prior studies, the incidence of CAP increased with age. A retrospective study using a nationwide claims database to determine the incidence of CAP in the Netherlands identified 195,372 cases of CAP between 2008 and 2011. This represented an average incidence of 295 cases per 100,000 population per year. The authors concluded that the mean annual cost of CAP in this population was 178 million euros, with a disproportionate amount (76%) of the cost being incurred by people older than 50 years. A case of Legionnaires disease from the Philadelphia outbreak, showing characteristics of relative bradycardia and extrapulmonary involvement. 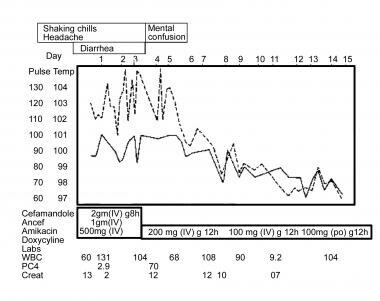 This graph outlines a case of Legionella pneumonia, showing characteristics of bradycardia and extrapulmonary involvement. Also shown is an initial lack of response to beta-lactam antibiotics, followed by effective treatment with doxycycline. With the exception of CAP due to particularly virulent organisms (eg, MRSA, Hantavirus, severe acute respiratory syndrome [SARS], Legionella), CAP does not typically present with shock in otherwise healthy hosts. 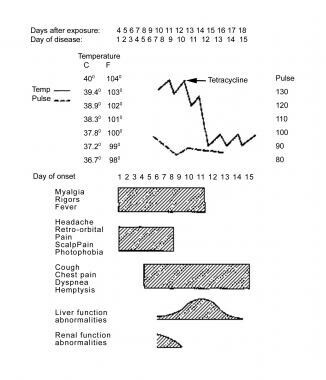 Therefore, in addition to considering the possibility of CAP due to a hypervirulent pathogen, patients who present with fever, dyspnea, leukocytosis, pulmonary infiltrates, and shock in the absence of conditions associated with hyposplenism should be evaluated for imitators of pneumonia, such as acute myocardial infarction or acute pulmonary embolism. Patients with community-acquired pneumonia (CAP) due to typical bacterial CAP pathogens typically present with fever, dyspnea, and productive cough, often with pleuritic chest pain. The clinical presentation of atypical CAP is more often subacute and associated with extrapulmonary manifestations that may provide a clue to the etiology. Contact with the appropriate zoonotic vector or its by-product (eg, milk, urine, feces, placenta) is needed to develop a zoonotic CAP. A history of occupational exposure to livestock (eg, farmers, veterinarians) or close contact with a parturient animal should be sought in patients with suspected Q fever. Psittacosis is preceded by recent contact with birds infected with C psittaci. Occupations and avocations associated with increased risk include poultry farming, pet shops, veterinary clinics, and ownership of pet birds (classically of the psittacine, or parrot, family). Hantavirus is transmitted via exposure to wild rodents, specifically to aerosolized rodent urine or feces; thus, queries as to whether a patient presenting with severe CAP works or recreates in a setting conducive to rodent exposure (eg, farms, ranches, forests) is warranted. Purulent sputum is characteristic of pneumonia caused by bacterial community-acquired pneumonia (CAP) pathogens and is not usually a feature of pneumonia caused by atypical pathogens, with the exception of Legionnaires disease. Blood-tinged sputum may be found in patients with pneumococcal pneumonia, Klebsiella pneumonia, or Legionella pneumonia. Rales are heard over the involved lobe or segment. Consolidation may be accompanied by an increase in tactile fremitus, bronchial breathing, and egophony. Be wary when a patient presents with severe CAP, with or without hypotension or shock. In these patients, be sure to exclude an underlying immunocompromise, asplenia, or acute pulmonary or cardiac event that could explain the severity of the CAP. Pleural effusion, if large enough, may be detectable on physical examination. In addition, patients with pleural effusion also have decreased tactile fremitus and dullness on chest percussion. On physical examination, empyema has the same findings as pleural effusion. Send sputum samples from patients with community-acquired pneumonia (CAP) for Gram stain and/or culture. Keep in mind that many patients, especially elderly persons, are not able to produce an adequate suitable sputum sample. Sputum Gram stain is reliable and diagnostic if performed on a well-collected specimen without many squamous epithelial cells (saliva contamination) and if a predominant organism is present. Gram stain shows few or no predominant organisms in patients with atypical CAP. Obtain blood cultures from all patients with CAP upon admission because some bacterial pathogens, such as S pneumoniae and H influenzae, are frequently associated with positive blood cultures. M catarrhalis bacteremia is rare. The differential diagnoses of community-acquired pneumonia (CAP) in patients with human immunodeficiency virus (HIV) infection is broader than in HIV-negative patients. The patient’s immunologic status, as reflected by the CD4 count, the clinical course, and the chest radiographic appearance, provides clues to the most likely etiologic organism. Patients with HIV infection and a normal or slightly decreased CD4 count with focal infiltrates have approximately the same pathogen distribution as otherwise healthy hosts (eg, S pneumoniae is most common) and thus warrant the same diagnostic strategies as the general population. Pneumocystis (carinii) jiroveci pneumonia (PJP) should be suspected in patients with a CD4 count of less than 200 cells/µL presenting with gradually progressive dyspnea, nonfocal infiltrates on chest radiography, nonproductive cough, and hypoxemia. A definitive diagnosis of PJP requires visualization of the P jirovecii cysts (ie, using special stains such as Giemsa or methenamine silver); bronchoscopy with bronchoalveolar lavage (BAL) is often necessary to obtain an adequate specimen. Individuals with HIV infection are also at increased risk for active pulmonary tuberculosis; the radiographic appearance of tuberculosis in HIV-infected patients varies, so tuberculosis should be considered in all patients with HIV and a pulmonary infiltrate. Patients with HIV and CAP should therefore be placed on airborne isolation (unless other etiology identified) until tuberculosis is excluded with three negative findings on acid-fast bacillus (AFB) smears/sputum cultures. Additional uncommon CAP pathogens, such as histoplasmosis, coccidioidomycosis, and cryptococcosis, should also be considered in HIV-positive patients who present with pulmonary infiltrates, with risk stratified according to potential exposure history. Antigen testing (urine antigen for histoplasmosis; serum antigen for cryptococcosis) may be helpful in these cases. Several nonspecific laboratory tests are often performed during the workup of community-acquired pneumonia (CAP), particularly if atypical CAP is suspected. Serum transaminase, serum sodium, serum ferritin, serum phosphorus, and creatine phosphokinase (CPK) levels may provide evidence supporting a particular pathogen, such as Legionella. C-reactive protein (CRP) levels and procalcitonin may help predict the likelihood of a bacterial origin for CAP. Lactic acid, white blood cell (WBC) count, blood urea nitrogen, and creatinine may be used in categorizing the severity of illness. Cold agglutinin titers of 1:32 or greater may support a diagnosis of M pneumoniae, however this test is neither sensitive nor specific. Cold-agglutinin antibodies (immunoglobulin M [IgM] autoantibodies directed against the erythrocyte) develop in 50%-75% of patients with M pneumoniae infection, peaking approximately 2 weeks into the illness. However, this finding is nonspecific, as low-titer cold-agglutinin elevations occur in various viral and neoplastic illnesses. Furthermore, a negative cold agglutinin titer finding does not exclude Mycoplasma infection. 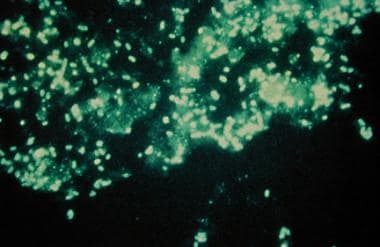 Direct fluorescent antibody (DFA) testing of the sputum can be performed to try to assist with the diagnosis of atypical CAP pathogens, including Legionella, P jiroveci, and Chlamydophila; however, the utility of this test is hampered by suboptimal sensitivity and is relatively difficult to perform. 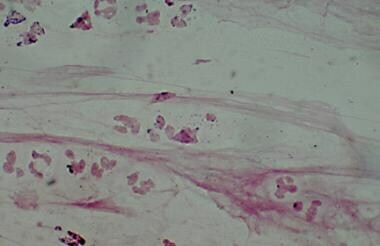 A DFA stain showing Legionella infection is seen in the image below. Sputum direct fluorescent antibody stain showing Legionella infection. Urinary antigen testing is considered the first-line diagnostic test for L pneumophila. The sensitivity of the test ranges from 55%-99%, with improved sensitivity paralleling disease severity. The urinary antigen test is applicable only for L pneumophila serogroup type I, which accounts for approximately 80% of infections. The urinary antigen test remains positive for Legionella for long periods but may be negative within the first 48 hours of infection. A 2016 study in the United Kingdom assessed the use of comprehensive molecular testing of a single lower respiratory tract specimen to detect a pathogen in CAP. The study compared (1) a combination of real-time multiplex PCR assays targeting 26 different pathogens, including bacteria and viruses, with (2) culture-based diagnostic testing of the same specimens. Quantification of bacterial load was performed for 8 common bacteria, including S pneumoniae, H influenzae, and M catarrhalis. A pathogen was detected in 87% of patients with CAP using the multiplex assay, whereas culture achieved a diagnosis in only 39% of cases. Viruses were detected in 30% of cases. H influenzae and S pneumoniae were the most commonly detected bacteria. Pathogen detection was not significantly decreased when a quantitative threshold for detection of ≥105 CFU/mL for all bacterial loads was applied, although the mean bacterial load was lower in patients who had received prior antibiotics than in those who had not. Interestingly, of the 268 patients who received antibiotics prior to testing, 77.6% had a positive bacterial PCR finding, but only 32% were culture-positive. The authors concluded that comprehensive molecular testing on a lower respiratory tract specimen has the potential to positively affect targeted antibiotic therapy in most patients with CAP. Chest radiograph in a patient with HIV infection, bilateral perihilar infiltrates, and Pneumocystis jiroveci pneumonia. Chest radiography findings may be negative in patients who present very early with CAP. In these patients, repeat chest radiography within 24 hours is recommended. 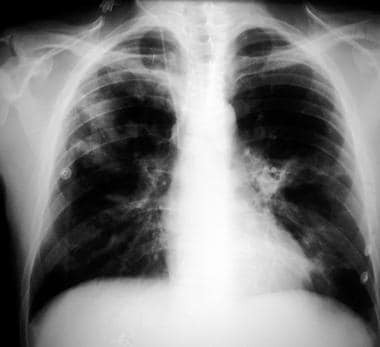 Chest radiography may assist with the differentiation of viral pneumonias from nonviral pneumonias. 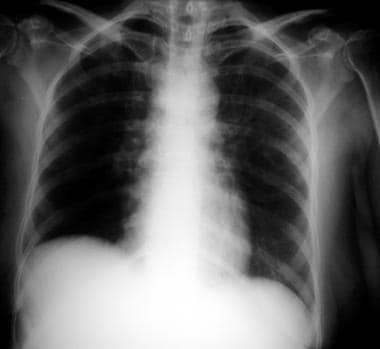 Viral pneumonias tend to display few or no infiltrates on chest radiography, but, when infiltrates are present, they are almost always bilateral, perihilar, symmetric, and interstitial. Bacterial pneumonias have a predominantly focal segmental or lobar distribution, with or without pleural effusions. Atypical bacterial pathogens have variable radiographic findings, ranging from focal segmental to bilateral interstitial disease. P jiroveci (PJP) pneumonia typically manifests as bilateral patchy interstitial infiltrates. Of note, radiographic findings alone are not reliable for differentiating specific etiologies of CAP. Chest radiographic findings should be negative in patients with asthma or exacerbation of chronic bronchitis who do not have CAP. The infiltrates observed with congestive heart failure (CHF) appear as increased interstitial markings and show vascular redistribution to the upper lobes. Patients with preexisting heart failure usually have cardiomegaly. Rapid cavitation is not a typical feature of CAP. Community-acquired methicillin-resistant S aureus (CA-MRSA) CAP presents as a fulminant CAP with rapid cavitation and necrotizing pneumonia caused by CA-MRSA (SCC mec IV) with the PVL gene, which sometimes occurs after influenza. Serial chest radiography can be used to observe the progression of CAP. Chest radiographic findings worsen rapidly and require a significant period to improve. It is important to note that clinical resolution occurs long before radiologic resolution. Obtain a computed tomography (CT) scan of the chest when an underlying bronchogenic carcinoma is suggested or if any abnormalities are not consistent with the diagnosis of pneumonia. Immunocompromised patients may benefit from further narrowing of differential diagnoses with chest CT scanning. Diagnostic bronchoscopy with bronchoalveolar lavage (BAL) may be useful in patients with community-acquired pneumonia (CAP) when Pneumocystis, mycobacteria, or fungal pathogens are likely. Diagnostic bronchoscopy with BAL with or without biopsy may also be useful in unresolving CAP that does not respond to appropriate therapy. Transthoracic fine-needle aspiration (FNA) of the infiltrate can be performed and is most useful in determining the cause of nodules or non–infection-associated infiltrates that are not responding to antibiotic treatment. Transtracheal aspiration (TTA) is a potentially hazardous procedure and offers no additional diagnostic information in patients with CAP. Lung sections with typical bacterial pneumonias show the progression from red hepatization to white hepatization during the resolution process. The lung is repaired or scarred after bacterial pneumonia is complete and the infectious process resolves. Because the severity of CAP is frequently due to underlying chronic disease, provide evidence-based sepsis management while administering antibiotics for CAP. Patients admitted with severe CAP and hypotension or shock are often hypotensive because of sepsis. If no acute cardiopulmonary explanation can be found (eg, exacerbation of severe underlying lung disease, exacerbation of preexisting CHF), patients with shock likely have diminished or absent splenic function or immunocompromise. Patients who are severely ill or unable to tolerate or absorb oral medications require a longer duration of intravenous therapy before switching to an oral antibiotic. If Pseudomonas is suspected, an antipseudomonal beta-lactam (piperacillin/tazobactam, cefepime, imipenem, or meropenem) plus ciprofloxacin or levofloxacin is recommended. If MRSA is suspected, vancomycin or linezolid is recommended. For patients with penicillin allergy, aztreonam is used instead of the beta-lactam in the regimen listed above. Mild to moderately ill patients with CAP may be treated entirely via the oral route, on either an inpatient or outpatient basis. Patients receiving oral antibiotics may be admitted for hospital services (eg, pulmonary toilet and additional diagnostic tests) that are not obtainable on an outpatient basis. If the patient is switched to an oral regimen and is doing well, earlier discharge from the hospital is possible. The oral therapy regimen can be completed at home. Optimal intravenous-to-oral switch therapy consists of a single agent that has an appropriate spectrum, has excellent bioavailability, is well tolerated, has a low resistance potential, and is relatively inexpensive. The duration of therapy for uncomplicated CAP is approximately 5-7 days. [7, 10] Patients should be afebrile 48-72 hours and have no signs of instability before antibiotic therapy is stopped. The duration of therapy may need to be longer if initial empiric therapy did not have activity against the detected pathogen. Very healthy young adults and children may be treated for shorter periods. The severity of CAP may be estimated with scoring systems that consider age, end organ damage manifested as uremia and/or confusion, respiratory rate, and blood pressure (CURB-65). Other scoring systems include the Pneumonia Severity Index (PSI), SMART-COP, A-DROP, and expanded CURB-65 (see Hospital admission). Prognosis is significantly affected by underlying conditions of the lungs, heart, and spleen. In otherwise healthy hosts with CAP, therapy does not need to cover S aureus, Klebsiella species, or P aeruginosa. S aureus coverage should be included in patients with influenza who have focal infiltrates. Most antibiotics used to treat community-acquired aspiration pneumonia (eg, beta-lactam/beta-lactamase inhibitor) are highly effective against oral anaerobes. Metronidazole and clindamycin are unnecessary unless anaerobic lung infection is suspected. For aerobic lung abscesses, clindamycin or moxifloxacin is preferable. [54, 55, 56, 57] Coverage should include typical (S pneumoniae, H influenzae, M catarrhalis) and atypical (Legionella and Mycoplasma species, C pneumoniae) pathogens. Most penicillin-resistant S pneumoniae infections may also be treated with beta-lactams. Alternately, doxycycline or respiratory quinolones may be used. Vancomycin is rarely, if ever, needed. High-level penicillin-resistant S pneumoniae (MIC 6 µg/mL) strains are a rare cause of CAP, although they remain susceptible to ceftriaxone. Eurich et al concluded that acid suppressants substantially increase the risk of recurrent pneumonia in high-risk elderly patients. In a cohort of elderly patients who had previously been hospitalized for pneumonia, the investigators studied PPI and H2 blocker use during 5.4 years of follow-up, matching 248 patients with recurrent pneumonia with 2476 controls. Patients in the study who were currently using PPI/H2 blocker had a higher rate of recurrent pneumonia than did nonusers (12% vs 8%, respectively). The diet in patients with CAP is as tolerated. Guide activity with common sense. Two pneumococcal vaccines are approved in the United States; 13-valent polysaccharide conjugate vaccine (PCV13; Prevnar 13) is approved for children aged 6 weeks to 17 years and adults aged 50 years or older. The 23-valent pneumococcal polysaccharide vaccine (PPSV23; Pneumovax 23) is approved for adults aged 65 years or older and persons aged 2 years or older who are at increased risk for pneumococcal disease. On February 1, 2016, the Advisory Committee on Immunization Practices (ACIP) published updated recommendations for pneumococcal vaccination in adults. The committee now recommends routine use of PCV13 in addition to PPSV23 for adults older than 65 years. It is recommended that an initial dose of PCV13 be given, followed by PPSV23 at least one year later. If PPSV23 has already been given, it should be followed by PCV13 a year later. A second dose of PPSV23 is not needed in immunocompetent hosts. If PPSV23 is inadvertently given prior to 1 year after PCV13, it does not need to be repeated. Nonleukopenic compromised hosts, such as those with rheumatoid arthritis, SLE, or alcoholism, may not develop an antibody response to the pneumococcal vaccine and may therefore remain susceptible to pneumococcal pneumonia. The same is true concerning the use of the Haemophilus vaccine. Remind patients with community-acquired pneumonia (CAP) to comply with the medication even after they experience clinical improvement. Except in patients with heart failure, adequate hydration and preservation of the cough reflex during the convalescent period are important. How is community-acquired pneumonia (CAP) transmitted? Which individuals are at increased risk for severe community-acquired pneumonia (CAP)? What are the possible complications of community-acquired pneumonia (CAP)? What is the relationship between community-acquired pneumonia (CAP) and myocardial infarction (MI)? What is a possible serious complication of community-acquired pneumonia (CAP) in patients with impaired splenic function? What factors increase the risk of morbidity and mortality associated with community-acquired pneumonia (CAP)? What is typical community-acquired pneumonia (CAP) and what is its clinical presentation? Which is the most common pathogen causing community-acquired pneumonia (CAP)? What is the clinical presentation of atypical community-acquired pneumonia (CAP) and which pathogens are involved? What are the extrapulmonary signs and symptoms of atypical community-acquired pneumonia (CAP)? How is the etiologic agent for atypical community-acquired pneumonia (CAP) identified? Which diagnostic studies are performed for community-acquired pneumonia (CAP)? Which tests may be useful in the diagnosis of community-acquired pneumonia (CAP)? What is the role of chest radiography in the evaluation of suspected community-acquired pneumonia (CAP)? Which scoring systems are used to assess the severity of community-acquired pneumonia (CAP)? What are the outpatient treatment options for community-acquired pneumonia (CAP)? How is community-acquired pneumonia (CAP) treated in patients with comorbidities? Which therapies are used for inpatient treatment of community-acquired pneumonia (CAP)? Which therapy is used in the ICU for patients with community-acquired pneumonia (CAP)? What are the treatment options if Pseudomonas is suspected in patients with community-acquired pneumonia (CAP)? What are the treatment options if MRSA infection is suspected in patients with community-acquired pneumonia (CAP)? When should therapy be initiated in patients with community-acquired pneumonia (CAP)? How should antibiotics be administered and for what duration in patients with community-acquired pneumonia (CAP)? What are the treatment options for immunocompromised patients with community-acquired pneumonia (CAP)? What is the etiology of community-acquired pneumonia (CAP)? Which bacterial pathogens commonly cause community-acquired pneumonia (CAP)? What is the most common bacterial pathogen causing community-acquired pneumonia (CAP)? What is the role of S aureus in the etiology of community-acquired pneumonia (CAP)? What are the roles of K pneumoniae and P aeruginosa in the pathogenesis of community-acquired pneumonia (CAP)? What are the possible etiologies of community-acquired pneumonia (CAP) in patients admitted to the ICU? Which atypical bacterial pathogens cause community-acquired pneumonia (CAP)? Which zoonotic atypical pathogens cause community-acquired pneumonia (CAP)? Which nonzoonotic atypical pathogens cause community-acquired pneumonia (CAP)? How are respiratory viruses transmitted in patients with atypical community-acquired pneumonia (CAP)? What are the incidence and prevalence of community-acquired pneumonia (CAP) in the US? What is the global incidence of community-acquired pneumonia (CAP)? Does the incidence of community-acquired pneumonia (CAP) increase with age? What are the negative prognostic factors of community-acquired pneumonia (CAP)? Which extrapulmonary findings suggest atypical community-acquired pneumonia (CAP)? Which extrapulmonary findings suggest Legionella pneumophila community-acquired pneumonia (CAP) (Legionnaires disease)? Which extrapulmonary findings suggest C burnetii community-acquired pneumonia (CAP) (Q fever)? What pathogens should be considered when shock is present in community-acquired pneumonia (CAP)? Which conditions are associated with severe community-acquired pneumonia (CAP)? Which physical findings suggest community-acquired pneumonia (CAP) due to typical bacterial pathogens? What is the clinical presentation of atypical community-acquired pneumonia (CAP)? Which patient history suggests zoonotic community-acquired pneumonia (CAP)? How is a pleural effusion detected in community-acquired pneumonia (CAP)? Which physical findings suggest community-acquired pneumonia (CAP)? Which atypical community-acquired pneumonia (CAP) may present with signs of consolidation? Which conditions should be excluded in patients presenting with severe community-acquired pneumonia (CAP) with or without hypotension or shock? How is empyema detected in community-acquired pneumonia (CAP)? Which conditions should be included in the differential diagnoses of community-acquired pneumonia (CAP)? What is the role of sputum studies in the evaluation of community-acquired pneumonia (CAP)? What is the role of blood cultures in the evaluation of community-acquired pneumonia (CAP)? What testing is useful in determining the community-acquired pneumonia (CAP) pathogen in patients with HIV infection? Which findings suggest pneumocystis (carinii) jiroveci pneumonia (PJP) in patients with community-acquired pneumonia (CAP) and HIV infection? What infection control measures should be taken when pulmonary tuberculosis is suspected in patients with community-acquired pneumonia (CAP) and HIV infection? What is the role of antigen testing in patients with HIV infection and community-acquired pneumonia (CAP)? What is the role of lab testing in the evaluation of community-acquired pneumonia (CAP)? What is the role of procalcitonin and C-reactive protein levels in the evaluation for community-acquired pneumonia (CAP)? What is the role of agglutinin levels in the evaluation for community-acquired pneumonia (CAP)? What is the role of direct fluorescent antibody (DFA) testing in the evaluation for community-acquired pneumonia (CAP)? What is the role of serology in the evaluation for community-acquired pneumonia (CAP)? What is the role of urine testing in the evaluation of community-acquired pneumonia (CAP)? Which diagnostic test is performed for Legionnaires disease (Legionella pneumophila) in the evaluation of community-acquired pneumonia (CAP)? What is the role of PCR assays in the evaluation for community-acquired pneumonia (CAP)? Are PCR assays effective in detecting pathogens associated with community-acquired pneumonia (CAP)? What is the role of chest radiography in the evaluation of community-acquired pneumonia (CAP)? Is chest radiography helpful in patients who present very early with community-acquired pneumonia (CAP)? Which radiographic findings suggest viral community-acquired pneumonia (CAP)? Which radiographic findings suggest bacterial community-acquired pneumonia (CAP)? Which radiographic findings help differentiate asthma or exacerbation of chronic bronchitis from community-acquired pneumonia (CAP)? Which radiographic findings suggest congestive heart failure (CHF) in patients with community-acquired pneumonia (CAP)? Which radiographic findings suggest community-acquired MRSA community-acquired pneumonia (CA-MRSA CAP)? What is the role of serial chest radiography in the evaluation of community-acquired pneumonia (CAP)? What is the role of CT scanning in the evaluation for community-acquired pneumonia (CAP)? What is the role of bronchoscopy with bronchoalveolar lavage (BAL) in the evaluation of community-acquired pneumonia (CAP)? What is the role of transthoracic fine-needle aspiration (FNA) in the evaluation of community-acquired pneumonia (CAP)? What is the role of transtracheal aspiration (TTA) in the evaluation for community-acquired pneumonia (CAP)? Which histologic findings suggest community-acquired pneumonia (CAP)? When is hospitalization indicated for patients with community-acquired pneumonia (CAP)? When is sepsis management indicated in the treatment of community-acquired pneumonia (CAP)? When should sepsis be considered in patients admitted with severe community-acquired pneumonia (CAP)? What guidelines have been released for the treatment of community-acquired pneumonia (CAP)? What are treatment options for community-acquired pneumonia (CAP) in patients with comorbidities? When is treatment with a nonmacrolide indicated for community-acquired pneumonia (CAP)? How is community-acquired pneumonia (CAP) treated in hospitalized patients? How is community-acquired pneumonia (CAP) treated in ICU patients? When is IV pharmacologic therapy indicated in the treatment of community-acquired pneumonia (CAP)? What are the treatment options for patients with mild to moderate community-acquired pneumonia (CAP)? When should hospitalized patients with community-acquired pneumonia (CAP) be discharged? What is the duration of therapy for uncomplicated community-acquired pneumonia (CAP)? What is the role of omadacycline (Nuzyra) in the treatment of bacterial community-acquired pneumonia (CAP)? What is the role of systemic corticosteroids in the treatment of community-acquired pneumonia (CAP)? How do comorbid conditions affect antimicrobial therapy selection for community-acquired pneumonia (CAP)? How is the severity of community-acquired pneumonia (CAP) estimated? What is the appropriate spectrum of antibiotic therapy for community-acquired pneumonia (CAP)? Which antibiotics are used to treat community-acquired pneumonia (CAP)? What is the preferred monotherapy for community-acquired pneumonia (CAP)? How are penicillin-resistant S pneumoniae infections treated in community-acquired pneumonia (CAP)? What is the role of proton-pump inhibitors (PPIs) in the treatment of community-acquired pneumonia (CAP)? Do proton-pump inhibitors (PPIs) increase the risk of recurrent community-acquired pneumonia (CAP) in elderly patients? How are patients receiving outpatient treatment for community-acquired pneumonia (CAP) monitored? What is the efficacy of pneumococcal vaccines for the prevention of community-acquired pneumonia (CAP)? Who should receive an annual influenza vaccination? Which vaccines are approved in the US for the prevention of community-acquired pneumonia (CAP)? What are the recommendations for pneumococcal vaccination in adults? Which patients may not develop an antibody response to the pneumococcal vaccine? What instructions should be given to patients being treated for community-acquired pneumonia (CAP)? Jain S, Self WH, Wunderink RG, Fakhran S, Balk R, Bramley AM, et al. Community-Acquired Pneumonia Requiring Hospitalization among U.S. Adults. N Engl J Med. 2015 Jul 30. 373 (5):415-27. [Medline]. Musher DM, Thorner AR. Community-acquired pneumonia. N Engl J Med. 2014 Oct 23. 371 (17):1619-28. [Medline]. Huijskens EG, Koopmans M, Palmen FM, van Erkel AJ, Mulder PG, Rossen JW. The value of signs and symptoms in differentiating between bacterial, viral and mixed aetiology in patients with community-acquired pneumonia. J Med Microbiol. 2014 Mar. 63 (Pt 3):441-52. [Medline]. Boersma WG, Daniels JM, Löwenberg A, Boeve WJ, van de Jagt EJ. Reliability of radiographic findings and the relation to etiologic agents in community-acquired pneumonia. Respir Med. 2006 May. 100(5):926-32. [Medline]. Bruns AH, Oosterheert JJ, Prokop M, Lammers JW, Hak E, Hoepelman AI. Patterns of resolution of chest radiograph abnormalities in adults hospitalized with severe community-acquired pneumonia. Clin Infect Dis. 2007 Oct 15. 45(8):983-91. [Medline]. Liu JL, Xu F, Hui Zhou, Wu XJ, Shi LX, Lu RQ, et al. Expanded CURB-65: a new score system predicts severity of community-acquired pneumonia with superior efficiency. Sci Rep. 2016 Mar 18. 6:22911. [Medline]. Postma DF, van Werkhoven CH, van Elden LJ, Thijsen SF, Hoepelman AI, Kluytmans JA, et al. Antibiotic treatment strategies for community-acquired pneumonia in adults. N Engl J Med. 2015 Apr 2. 372 (14):1312-23. [Medline]. Wunderink RG, Waterer GW. Clinical practice. Community-acquired pneumonia. N Engl J Med. 2014 Feb 6. 370 (6):543-51. [Medline]. Blasi F, Tarsia P. Value of short-course antimicrobial therapy in community-acquired pneumonia. Int J Antimicrob Agents. 2005 Dec. 26 Suppl 3:S148-55. [Medline]. Dunbar LM, Khashab MM, Kahn JB, Zadeikis N, Xiang JX, Tennenberg AM. Efficacy of 750-mg, 5-day levofloxacin in the treatment of community-acquired pneumonia caused by atypical pathogens. Curr Med Res Opin. 2004 Apr. 20(4):555-63. [Medline]. Harrington Z, Barnes DJ. One drug or two? Step-down therapy after i.v. antibiotics for community-acquired pneumonia. Intern Med J. 2007 Nov. 37(11):767-71. [Medline]. Scalera NM, File TM Jr. How long should we treat community-acquired pneumonia?. Curr Opin Infect Dis. 2007 Apr. 20(2):177-81. [Medline]. Aliberti S, Blasi F, Zanaboni AM, Peyrani P, Tarsia P, Gaito S, et al. Duration of antibiotic therapy in hospitalised patients with community-acquired pneumonia. Eur Respir J. 2010 Jul. 36(1):128-34. [Medline]. Alvarez-Lerma F, Torres A. Severe community-acquired pneumonia. Curr Opin Crit Care. 2004 Oct. 10(5):369-74. [Medline]. Brown SM, Jones BE, Jephson AR, Dean NC. Validation of the Infectious Disease Society of America/American Thoracic Society 2007 guidelines for severe community-acquired pneumonia. Crit Care Med. 2009 Dec. 37(12):3010-6. [Medline]. [Full Text]. Carron M, Freo U, Zorzi M, Ori C. Predictors of failure of noninvasive ventilation in patients with severe community-acquired pneumonia. J Crit Care. 2010 Sep. 25(3):540.e9-14. [Medline]. Cunha BA. Severe Community-acquired Pneumoniae in the Critical Care Unit. Cunha BA (ed). Infectious Disease in Critical Care Medicine. 3rd Ed. New York, New York: Informa Healthcare; 2010. pp. 164-177. Nakanishi M, Yoshida Y, Takeda N, Hirana H, Horita T, Shimizu K, et al. Significance of the progression of respiratory symptoms for predicting community-acquired pneumonia in general practice. Respirology. 2010 Aug. 15(6):969-74. [Medline]. Holter JC, Müller F, Bjørang O, Samdal HH, Marthinsen JB, Jenum PA, et al. Etiology of community-acquired pneumonia and diagnostic yields of microbiological methods: a 3-year prospective study in Norway. BMC Infect Dis. 2015 Feb 15. 15:64. [Medline]. Howard LS, Sillis M, Pasteur MC, Kamath AV, Harrison BD. Microbiological profile of community-acquired pneumonia in adults over the last 20 years. J Infect. 2005 Feb. 50(2):107-13. [Medline]. Cilloniz C, Ewig S, Ferrer M, et al. Community acquired polymicrobial pneumonia in the intensive care unit: aetiology and prognosis. Crit Care. 2011 Sep 14. 15(5):R209. [Medline]. Burillo A, Bouza E. Chlamydophila pneumoniae. Infect Dis Clin North Am. 2010 Mar. 24(1):61-71. [Medline]. File TM Jr, Marrie TJ. Burden of community-acquired pneumonia in North American adults. Postgrad Med. 2010 Mar. 122(2):130-41. [Medline]. Jackson ML, Neuzil KM, Thompson WW, Shay DK, Yu O, Hanson CA, et al. The burden of community-acquired pneumonia in seniors: results of a population-based study. Clin Infect Dis. 2004 Dec 1. 39(11):1642-50. [Medline]. McLaughlin JM, Johnson MH, Kagan SA, Baer SL. Clinical and economic burden of community-acquired pneumonia in the Veterans Health Administration, 2011: a retrospective cohort study. Infection. 2015 Dec. 43 (6):671-80. [Medline]. Rozenbaum MH, Mangen MJ, Huijts SM, van der Werf TS, Postma MJ. Incidence, direct costs and duration of hospitalization of patients hospitalized with community acquired pneumonia: A nationwide retrospective claims database analysis. Vaccine. 2015 Jun 22. 33 (28):3193-9. [Medline]. Teramoto S, Yamamoto H, Yamaguchi Y, Hanaoka Y, Ishii M, Hibi S, et al. Lower respiratory tract infection outcomes are predicted better by an age >80 years than by CURB-65. Eur Respir J. 2008 Feb. 31 (2):477-8; author reply 478. [Medline]. Marrie TJ, Poulin-Costello M, Beecroft MD, Herman-Gnjidic Z. Etiology of community-acquired pneumonia treated in an ambulatory setting. Respir Med. 2005 Jan. 99(1):60-5. [Medline]. Falguera M, Pifarre R, Martin A, Sheikh A, Moreno A. Etiology and outcome of community-acquired pneumonia in patients with diabetes mellitus. Chest. 2005 Nov. 128(5):3233-9. [Medline]. Baum S. Mycoplasma pneumoniae and atypical pneumonia. Mandell, Bennett, & Dolin, eds. Principles and Practice of Infectious Diseases. 7th ed. Churchill Livingstone; 2010. Chapter 185. Anderson A, Bijlmer H, Fournier PE, Graves S, Hartzell J, Kersh GJ, et al. Diagnosis and management of Q fever--United States, 2013: recommendations from CDC and the Q Fever Working Group. MMWR Recomm Rep. 2013 Mar 29. 62 (RR-03):1-30. [Medline]. Marrie TJ, Raoult D. Coxiella burnetti (Q fever). Mandell G, BennettJ, Dolin R, eds. PPID. 7th ed. Churchill Livingstone; 2009. Chapter 189. Galetto-Lacour A, Alcoba G, Posfay-Barbe KM, Cevey-Macherel M, Gehri M, Ochs MM, et al. Elevated Inflammatory Markers Combined with Positive Pneumococcal Urinary Antigen are a Good Predictor of Pneumococcal Community Acquired Pneumonia in Children. Pediatr Infect Dis J. 2013 May 20. [Medline]. Giulia B, Luisa A, Concetta S, Bruna LS, Chiara B, Marcello C. Procalcitonin and community-acquired pneumonia (CAP) in children. Clin Chim Acta. 2015 Dec 7. 451 (Pt B):215-8. [Medline]. Loens K, Ieven M. Mycoplasma pneumoniae: Current Knowledge on Nucleic Acid Amplification Techniques and Serological Diagnostics. Front Microbiol. 2016. 7:448. [Medline]. Harris AM, Beekmann SE, Polgreen PM, Moore MR. Rapid urine antigen testing for Streptococcus pneumoniae in adults with community-acquired pneumonia: clinical use and barriers. Diagn Microbiol Infect Dis. 2014 Aug. 79 (4):454-7. [Medline]. Huijskens EG, Rossen JW, Kluytmans JA, van der Zanden AG, Koopmans M. Evaluation of yield of currently available diagnostics by sample type to optimize detection of respiratory pathogens in patients with a community-acquired pneumonia. Influenza Other Respir Viruses. 2014 Mar. 8 (2):243-9. [Medline]. Gadsby NJ, Russell CD, McHugh MP, Mark H, Conway Morris A, Laurenson IF, et al. Comprehensive Molecular Testing for Respiratory Pathogens in Community-Acquired Pneumonia. Clin Infect Dis. 2016 Apr 1. 62 (7):817-23. [Medline]. Davydov L, Ebert SC, Restino M, Gardner M, Bedenkop G, Uchida KM. Prospective evaluation of the treatment and outcome of community-acquired pneumonia according to the Pneumonia Severity Index in VHA hospitals. Diagn Microbiol Infect Dis. 2006 Apr. 54(4):267-75. [Medline]. Fishbane S, Niederman MS, Daly C, Magin A, Kawabata M, de Corla-Souza A. The impact of standardized order sets and intensive clinical case management on outcomes in community-acquired pneumonia. Arch Intern Med. 2007 Aug 13-27. 167(15):1664-9. [Medline]. Marrie TJ, Huang JQ. Low-risk patients admitted with community-acquired pneumonia. Am J Med. 2005 Dec. 118(12):1357-63. [Medline]. Marrie TJ, Shariatzadeh MR. Community-acquired pneumonia requiring admission to an intensive care unit: a descriptive study. Medicine (Baltimore). 2007 Mar. 86(2):103-11. [Medline]. Yoshimoto A, Nakamura H, Fujimura M, Nakao S. Severe community-acquired pneumonia in an intensive care unit: risk factors for mortality. Intern Med. 2005 Jul. 44(7):710-6. [Medline]. Genné D, Sommer R, Kaiser L, Saaïdia A, Pasche A, Unger PF. Analysis of factors that contribute to treatment failure in patients with community-acquired pneumonia. Eur J Clin Microbiol Infect Dis. 2006 Mar. 25(3):159-66. [Medline]. Nuzyra (omadacycline) [package insert]. Boston, MA: Paratek Pharmaceuticals, Inc. 2018 October. Available at [Full Text]. Siemieniuk RA, Meade MO, Alonso-Coello P, Briel M, Evaniew N, Prasad M, et al. Corticosteroid Therapy for Patients Hospitalized With Community-Acquired Pneumonia: A Systematic Review and Meta-analysis. Ann Intern Med. 2015 Oct 6. 163 (7):519-28. [Medline]. Restrepo MI, Anzueto A, Torres A. Corticosteroids for Severe Community-Acquired Pneumonia: Time to Change Clinical Practice. Ann Intern Med. 2015 Oct 6. 163 (7):560-1. [Medline]. Snijders D, Daniels JM, de Graaff CS, van der Werf TS, Boersma WG. Efficacy of corticosteroids in community-acquired pneumonia: a randomized double-blinded clinical trial. Am J Respir Crit Care Med. 2010 May 1. 181 (9):975-82. [Medline]. Torres A, Sibila O, Ferrer M, Polverino E, Menendez R, Mensa J, et al. Effect of corticosteroids on treatment failure among hospitalized patients with severe community-acquired pneumonia and high inflammatory response: a randomized clinical trial. JAMA. 2015 Feb 17. 313 (7):677-86. [Medline]. An MM, Zou Z, Shen H, Gao PH, Cao YB, Jiang YY. Moxifloxacin monotherapy versus beta-lactam-based standard therapy for community-acquired pneumonia: a meta-analysis of randomised controlled trials. Int J Antimicrob Agents. 2010 Jul. 36(1):58-65. [Medline]. Anzueto A, Niederman MS, Pearle J, Restrepo MI, Heyder A, Choudhri SH. Community-Acquired Pneumonia Recovery in the Elderly (CAPRIE): efficacy and safety of moxifloxacin therapy versus that of levofloxacin therapy. Clin Infect Dis. 2006 Jan 1. 42(1):73-81. [Medline]. Davis SL, Delgado G Jr, McKinnon PS. Pharmacoeconomic considerations associated with the use of intravenous-to-oral moxifloxacin for community-acquired pneumonia. Clin Infect Dis. 2005 Jul 15. 41 Suppl 2:S136-43. [Medline]. Welte T, Petermann W, Schürmann D, Bauer TT, Reimnitz P,. Treatment with sequential intravenous or oral moxifloxacin was associated with faster clinical improvement than was standard therapy for hospitalized patients with community-acquired pneumonia who received initial parenteral therapy. Clin Infect Dis. 2005 Dec 15. 41(12):1697-705. [Medline]. Chokshi R, Restrepo MI, Weeratunge N, Frei CR, Anzueto A, Mortensen EM. Monotherapy versus combination antibiotic therapy for patients with bacteremic Streptococcus pneumoniae community-acquired pneumonia. Eur J Clin Microbiol Infect Dis. 2007 Jul. 26(7):447-51. [Medline]. Restrepo MI, Frei CR. Health economics of use fluoroquinolones to treat patients with community-acquired pneumonia. Am J Med. 2010 Apr. 123(4 Suppl):S39-46. [Medline]. Ailani RK, Agastya G, Ailani RK, Mukunda BN, Shekar R. Doxycycline is a cost-effective therapy for hospitalized patients with community-acquired pneumonia. Arch Intern Med. 1999 Feb 8. 159(3):266-70. [Medline]. Eurich DT, Sadowski CA, Simpson SH, Marrie TJ, Majumdar SR. Recurrent community-acquired pneumonia in patients starting acid-suppressing drugs. Am J Med. 2010 Jan. 123(1):47-53. [Medline]. Herzig SJ, Howell MD, Ngo LH, Marcantonio ER. Acid-suppressive medication use and the risk for hospital-acquired pneumonia. JAMA. 2009 May 27. 301(20):2120-8. [Medline]. Dublin S, Walker RL, Jackson ML, Nelson JC, Weiss NS, Jackson LA. Use of proton pump inhibitors and H2 blockers and risk of pneumonia in older adults: a population-based case-control study. Pharmacoepidemiol Drug Saf. 2010 Aug. 19(8):792-802. [Medline]. Restrepo MI, Mortensen EM, Anzueto A. Common medications that increase the risk for developing community-acquired pneumonia. Curr Opin Infect Dis. 2010 Apr. 23(2):145-51. [Medline]. Ro Y, Eun CS, Kim HS, Kim JY, Byun YJ, Yoo KS, et al. Risk of Clostridium difficile Infection with the Use of a Proton Pump Inhibitor for Stress Ulcer Prophylaxis in Critically Ill Patients. Gut Liver. 2016 Jul 15. 10 (4):581-6. [Medline]. Bjerre LM, Verheij TJ, Kochen MM. Antibiotics for community acquired pneumonia in adult outpatients. Cochrane Database Syst Rev. 2009 Oct 7. CD002109. [Medline]. Carrie AG, Kozyrskyj AL. Outpatient treatment of community-acquired pneumonia: evolving trends and a focus on fluoroquinolones. Can J Clin Pharmacol. 2006. 13(1):e102-11. [Medline]. Segreti J, House HR, Siegel RE. Principles of antibiotic treatment of community-acquired pneumonia in the outpatient setting. Am J Med. 2005 Jul. 118 Suppl 7A:21S-28S. [Medline]. Bonten MJ, Huijts SM, Bolkenbaas M, Webber C, Patterson S, Gault S, et al. Polysaccharide conjugate vaccine against pneumococcal pneumonia in adults. N Engl J Med. 2015 Mar 19. 372 (12):1114-25. [Medline]. Kim DK, Bridges CB, Harriman KH, Advisory Committee on Immunization Practices (ACIP), ACIP Adult Immunization Work Group. Advisory Committee on Immunization Practices Recommended Immunization Schedule for Adults Aged 19 Years or Older--United States, 2016. MMWR Morb Mortal Wkly Rep. 2016 Feb 5. 65 (4):88-90. [Medline]. Talbot HK, Zhu Y, Chen Q, Williams JV, Thompson MG, Griffin MR. Effectiveness of influenza vaccine for preventing laboratory-confirmed influenza hospitalizations in adults, 2011-2012 influenza season. Clin Infect Dis. 2013 Jun. 56 (12):1774-7. [Medline]. Phrommintikul A, Kuanprasert S, Wongcharoen W, Kanjanavanit R, Chaiwarith R, Sukonthasarn A. Influenza vaccination reduces cardiovascular events in patients with acute coronary syndrome. Eur Heart J. 2011 Jul. 32 (14):1730-5. [Medline]. Udell JA, Zawi R, Bhatt DL, Keshtkar-Jahromi M, Gaughran F, Phrommintikul A, et al. Association between influenza vaccination and cardiovascular outcomes in high-risk patients: a meta-analysis. JAMA. 2013 Oct 23. 310 (16):1711-20. [Medline]. Powner J, Gallaher T, Colombo R, Baer S, Huber L, Kheda M, et al. Influenza vaccination reduced pneumococcal disease in incident dialysis patients. American Society of Nephrology. 2014. Grohskopf LA, Sokolow LZ, Olsen SJ, Bresee JS, Broder KR, Karron RA. Prevention and Control of Influenza with Vaccines: Recommendations of the Advisory Committee on Immunization Practices, United States, 2015-16 Influenza Season. MMWR Morb Mortal Wkly Rep. 2015 Aug 7. 64 (30):818-25. [Medline]. Kobayashi M, Bennett NM, Gierke R, Almendares O, Moore MR, Whitney CG, et al. Intervals Between PCV13 and PPSV23 Vaccines: Recommendations of the Advisory Committee on Immunization Practices (ACIP). MMWR Morb Mortal Wkly Rep. 2015 Sep 4. 64 (34):944-7. [Medline]. Mortensen EM, Halm EA, Pugh MJ, Copeland LA, Metersky M, Fine MJ, et al. Association of azithromycin with mortality and cardiovascular events among older patients hospitalized with pneumonia. JAMA. 2014 Jun 4. 311(21):2199-208. [Medline]. Busko M. Azithromycin Benefits Outweigh MI Risks in Older Pneumonia Patients. Medscape Medical News. Available at http://www.medscape.com/viewarticle/826175. Accessed: June 9, 2014. Cunha BA. Elevated Serum Transaminases in Mycoplasma pneumoniae Pneumonia. Clin Microbiol Infect. 2005. 11:1051-1054. Cunha BA. Hypophosphatemia: Diagnostic Significance in Legionnaires' Disease. Am J Med. 2006. 119:5-6. Bradley, JS et al. The management of community-acquired pneumonia in infants and children older than 3 months of age: Clinical practice guidelines by the Pediatric Infectious Diseases Society and the Infectious Diseases Society of America. Clin Infect Dis. 2011. 53:e25-e76. Boselli E, Breilh D, Rimmelé T, Djabarouti S, Saux MC, Chassard D. Pharmacokinetics and intrapulmonary diffusion of levofloxacin in critically ill patients with severe community-acquired pneumonia. Crit Care Med. 2005 Jan. 33(1):104-9. [Medline]. Mokabberi R, Haftbaradaran A, Ravakhah K. Doxycycline vs. levofloxacin in the treatment of community-acquired pneumonia. J Clin Pharm Ther. 2010 Apr. 35(2):195-200. [Medline]. Noreddin AM, Elkhatib WF. Levofloxacin in the treatment of community-acquired pneumonia. Expert Rev Anti Infect Ther. 2010 May. 8(5):505-14. [Medline]. Cunha BA (ed). Pneumonia Essentials. 3rd Ed. Sudbury, MA: Jones & Bartlett; 2010. Boulware DR, Daley CL, Merrifield C, Hopewell PC, Janoff EN. Rapid diagnosis of pneumococcal pneumonia among HIV-infected adults with urine antigen detection. J Infect. 2007 Oct. 55(4):300-9. [Medline]. Westley BP, Chan PA. Questions remain regarding mandatory use of macrolides in community-acquired pneumonia. Intensive Care Med. 2010 Oct. 36(10):1787; author reply 1789-90. [Medline]. Iannini PB, Paladino JA, Lavin B, Singer ME, Schentag JJ. A case series of macrolide treatment failures in community acquired pneumonia. J Chemother. 2007 Oct. 19(5):536-45. [Medline]. Lodise TP, Kwa A, Cosler L, Gupta R, Smith RP. Comparison of beta-lactam and macrolide combination therapy versus fluoroquinolone monotherapy in hospitalized Veterans Affairs patients with community-acquired pneumonia. Antimicrob Agents Chemother. 2007 Nov. 51(11):3977-82. [Medline]. Johnstone J, Marrie TJ, Eurich DT, Majumdar SR. Effect of pneumococcal vaccination in hospitalized adults with community-acquired pneumonia. Arch Intern Med. 2007 Oct 8. 167(18):1938-43. [Medline]. Boggs W. Narrow-Spectrum Antibiotics Effective as Empiric Therapy for Pediatric Pneumonia. Medscape [serial online]. Available at http://www.medscape.com/viewarticle/818253. Accessed: January 5, 2014. Queen MA, Myers AL, Hall M, Shah SS, Williams DJ, Auger KA, et al. Comparative effectiveness of empiric antibiotics for community-acquired pneumonia. Pediatrics. 2014 Jan. 133(1):e23-9. [Medline]. Restrepo MI, Mortensen EM, Pugh JA, Anzueto A. COPD is associated with increased mortality in patients with community-acquired pneumonia. Eur Respir J. 2006 Aug. 28(2):346-51. [Medline]. Gram stain showing Moraxella catarrhalis. Clinical diagnostic approach in community-acquired pneumonias. Disclosure: Received research grant from: Pfizer.